Will Loss of Parking Perk Get Community Board Chairs Out of Their Cars? It’s no secret that NYC community boards are highly protective of on-street parking, since their members seem more likely to be car owners than the population at large, but it was news to us that board chairs and district managers have free parking perks. The Brooklyn Paper reports that, come February 1, community board chairs will lose the city-issued placards that allow them to park in metered spots for three hours. While you’d think that would spur them to walk, bike, or take transit to get to meetings in their own neighborhoods, CB 15 chair Theresa Scavo says she will spend less time performing civic duties and more time feeding the meter. “If I park at a meter that only takes an hour’s worth of quarters, I can’t stay at the meetings the whole time,” Scavo said. Judging from the quotes collected for this story, it’s as if free parking is considered a reward for the onerous burden of community service — even among community board staff, who are paid for their work. Turano and other district managers will retain their parking perks. The sense of entitlement on display here goes a long way toward explaining why many community boards tend to value curbside parking — for automobiles, not bikes — above all else. From street safety projects to Greenmarkets, in some districts no sacrifice is too great when it comes to preserving the privilege of on-street vehicle storage. If it looks like their volunteer work might compromise the time required to tend to their cars, Scavo and other auto-dependent board chairs should consider surrendering their posts to people who have a more realistic perspective on what it’s like to get around in New York. I hate to break it to you, but most CB chairs are close enough with their local Pct that they’re not going to get ticketed anyway. The official placard is gone, but a business card on the dashboard (or a recognizable car – Hello Dolly Williams!) is often just as effective. Maybe to convince them about the importance of biking and transit is to give them free bikes and metro cards. Anyone with a parking placard should automatically lose their right to weigh in on transportation-related issues. They’re just not coming from the same perspective as everyone else. If, for example, my best friend were a dentist and I received free dental care for life, I would do the right thing and shut the hell up in a debate about dental insurance. Interesting…I’ve been on my community board for 8 years, and never heard about this…perhaps because our chair doesn’t own a car? I am curious (and perhaps Streetsblog could do some digging) about how many CB chairs have cars, and how many use them routinely to get to meetings. I’ve noticed that the demographics of CB members tend to skew older – at least based on the meetings that I’ve attended of my board. Could that have something to do with this, especially in the outer boroughs? i.e. older, long-time city residents whose experience of public transit was shaped by the ‘bad old days’ of the 1970s, and who view bikes as toys for children? Eliminate the placards altogether. 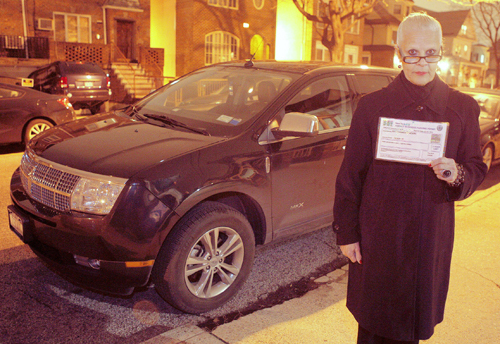 Then, have “No Parking – Community Board Chairperson Only” spots set aside on each block. Then see how the citizens weigh in on parking issues. I’ve been on a Board for over 15 years and never knew that our Chairperson has a permit. Our Chair is an avid bike rider who has little use for a permit. Anyone who claims they can’t attend full Community Board meetings if they don’t get free parking is unfit to represent their community. They are not rational. More broadly, community board participation excludes people who are busy in the evening: either working, studying, or taking care of family. There are also parts of Brooklyn and Queens, like Bklyn district 18 mentioned in the article, that have poor transit access, especially in evening hours. Asking people with families to spend a half hour or more getting home from a neighborhood volunteer meeting is a lot to ask, in my opinion. Don’t forget the freezing temperatures we are suffering right now, which also dissuade people from attending evening meetings. If giving out parking permits makes it easier for people to attend meetings who wouldn’t ordinarily go, then I think it should be done as a matter of course. It also seems to me that board chairpeople are probably quite invested in the process and would be likely to continue attending meetings in any case. Four out of 59 community board chairpersons were interviewed; broad brush much?